Play the addictive fruit cutting game and fulfill your desire of slicing fruits. Fruit Ninja is one of the most popular Android Games of all time with more than 100 million downloads worldwide. It has also a paid version which is also very popular. Reason for popularity of this addictive game is ever increasing desire of slicing and destructing more and more fruits. 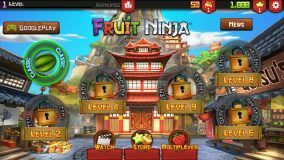 Fruit Ninja is an immersive game created exclusively for all game lovers who are looking for an exciting game to spend their free time. The moment you start playing this game you will not want to leave your hand again. Also you will want to play at every opportunity. The game has extremely colorful animations, realistic effects and voices. Billions of people around the world are playing this game like crazy. What are you waiting for more? In the vote you will be an ingenious ninja who shoots exactly 12 targets. Many more fruit varieties such as watermelon, apples, oranges, kiwi and bananas which are available on your screen application, will come in order, but quite quickly. Using the touch of your smartphone, you need to cut these foliage with a very sharp sword with the help of your fingers. But it will not be as easy as you think, you have to be very serial to do this, your fingers must work very fast. Fruit ninja has three modes of play namely Arcade, Classic and Zen. Upon your success, ninja Sensei will become happy from you and tell you fun facts about fruits. The free version does not have zen mode. Zen mode do not include any bombs. Also Fruit ninja free don’t have online multiplayer mode. The paid version of fruit ninja costs around $1 and is by the name fruit ninja classic on play store. 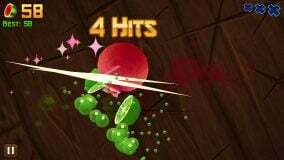 What's new in this version of Fruit Ninja?